Super Micro-Grain PCD features cutting edge strength, wear resistance, fracture resistance, good edge-sharpening performance and long, stable tool life. 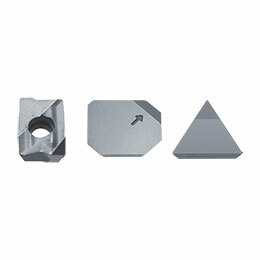 Kyocera's diamond material is a synthetic diamond sintered under high temperatures and pressures. PCD (Polycrystalline diamond) is ideal for non-ferrous metals and non-metals. High speed cutting of aluminum alloys, brass, non-ferrous metals and non-metals including plastics, fiberglass, carbide and ceramics.